Playing Catch-up With Some Food! Although The Kid and I spent most of the day on the road traveling, I wanted to catch up a few cooking and baking posts that I skipped. We missed the window before Christmas to make the frosted sugar cookies that are popular around the holidays. 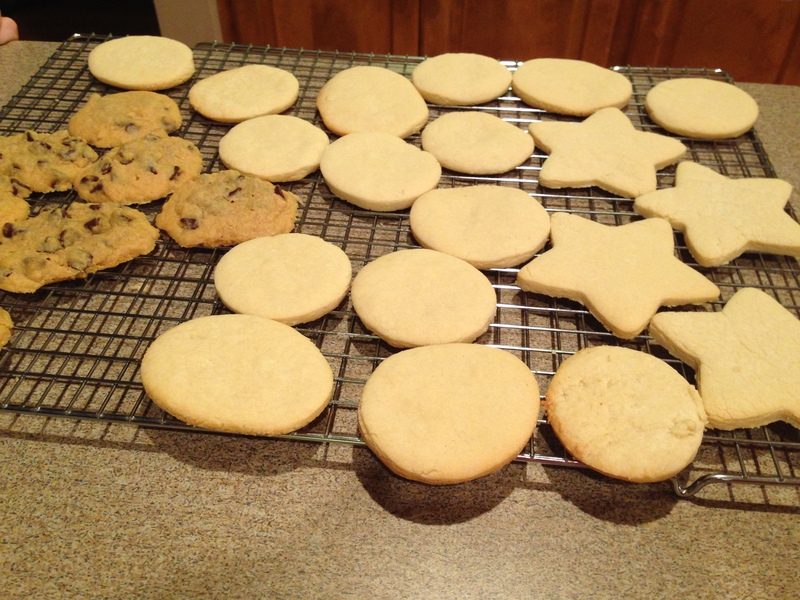 In years past, it had been a holiday tradition to make tens of dozens of carefully baked and decorated sugar cookies, along with an assortment of other cookies like oatmeal-raisin, and chocolate chip as well as small loafs of banana bread and corn bread and blue berry muffins. We would load up baskets and deliver to friends, neighbors and co-workers. It started out enjoyable, but repeating – and often larger – these gift baskets became more and more work and less and less fun. Eventually, we stopped with the move to Kansas City. No one had any expectations and we took advantage of that. But I missed, to some extent, the fun of the cookie decorating. So, a few days ago, The Kid and I pulled out my old copy of Better Homes & Garden cookbook and whipped up a double batch of sugar cookies. At the same time, The Kid baked up a dozen or so chocolate chip cookies from a mix. I love that he doesn’t hesitate to experiment, roll up his sleeves and learn to bake and cook. He’s gonna make someone a wonderful husband some day. We went easy and only cut large and small circles and a few stars. We whipped up my mom’s well loved powdered sugar frosting and each cookies was given a generous swipe. Decorations were limited to some course colored sugars. I failed even to capture any photos of the “afters”, as they weren’t really great to look at but delicious to eat! Another evening, The Kid had a craving for crab legs and rather than go out for a meal, he opted to prepare one instead. 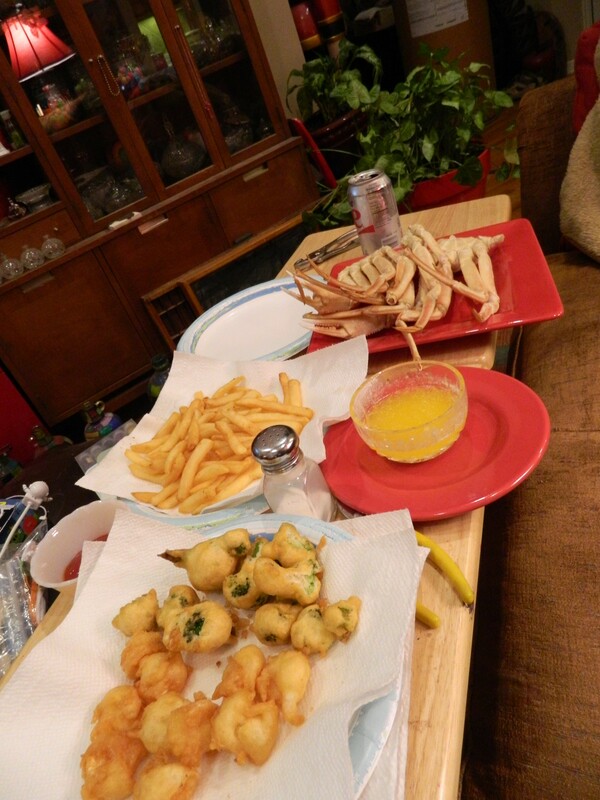 We had deep fried battered shrimp, garlic sauteed shrimp, steamed crab legs, fries, and deep fried battered broccoli. He did everything from prep to clean up! He is so talented and I couldn’t resist. It wasn’t hard to enjoy everything! With the leftover batter, we made corn fritters, just battered corn kernels deep fried and then dipped in honey. Makes a great dessert and was the perfect end to this dinner! Geez, I’m almost making myself hungry writing about all of this food!